The USATF rules from what I understand provide for denial of sanction next year in this case. Maybe Bill Cobler and Demetrio could help enforce payment this way. I have several other ideas also. 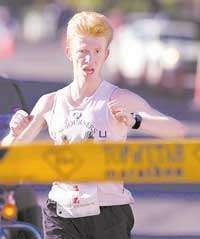 In any case it shows a complete lack of respect by Devine Racing for the running community. I have sent 2 emails so far to Scott Kerr and have got no reply. He and others will be getting e-mails from a lot of people. We also have two lawyers on the blog (Chad and Sam) that know other lawyers I suppose. Lawyers are good at writing letters and making phone calls, that is how I got my visa to come to the United States. Chad's wife Heather works for Salt Lake Tribune. Those are the connections I am immediately aware of. There is probably more. If we go full blast after them, Devine Racing is not going to like it. Plantar Fasciitis. I have been battling it for about a month now. It has really slowed me down. (Big time.) I have been using the sock at night. I put inserts in my shoes. I have been stretching. I was trying to run with the pain. But the condition did not get better and was getting worse. it is a very frustrating injury!